I received a text message last Friday from Carolyn with an invite to a flower design class she had signed up for. Carolyn and I have a love for all things creative and crafty. Food and home decorating are my thing and food and flowers are hers. It should be noted that she is an amazing baker and loves cooking, sharing recipes, trading cookbooks, trying new restaurants, and attending food themed events with me and I’ve also been known to play with flowers on occasion – helped her with a friend’s wedding flowers, shopped farmer’s market flowers, spent hours at Green Acres and other flower farms and nurseries with her. We support each other’s hobbies and are always on the hunt for new things to explore to expand on them. That kind of friendship rocks and it’s why I always click on links from Carolyn. The above graphic appeared on my phone. I was intrigued, so yes, I clicked on the link and after some mild arm twisting (not really), I purchased my ticket to join Carolyn this past Sunday. 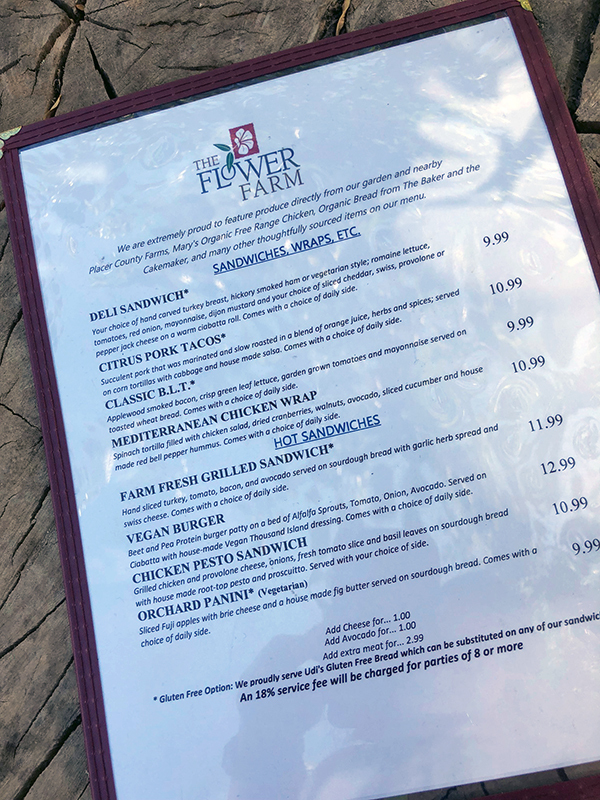 We started off our adventure with grabbing lunch at The Flower Farm, located in Loomis, CA at 4150 Auburn Folsom Road. 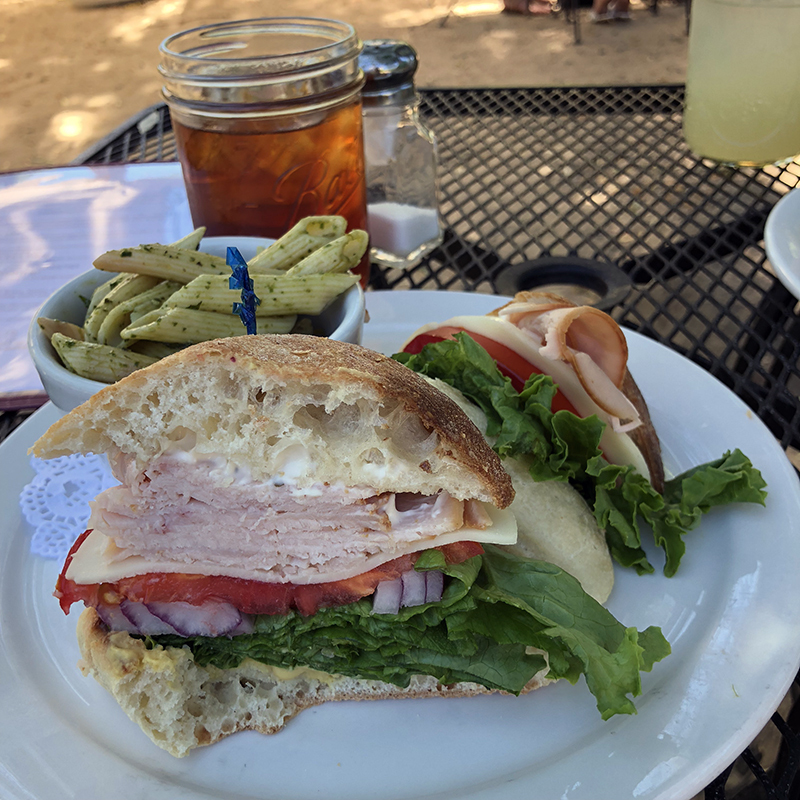 Carolyn ordered first and I basically copied her – I’ve been cutting way back on carbs, but fresh ciabatta bread from The Baker and The Cakemaker (a husband and wife owned artisan bread bakery) providing Placer County and surrounding areas with quality handcrafted artisan bread… sounded fabulous. Hand carved turkey breast, romaine lettuce, tomatoes, red onion, mayonnaise, Dijon mustard and sliced provolone on a warm ciabatta roll (Organic wheat flour, olive oil, water, yeast, sea salt). I opted for pesto pasta salad as my side and unsweetened iced tea as my beverage. I tasted hints of mint in the pasta salad – it was unexpected and I ended up really liking it. 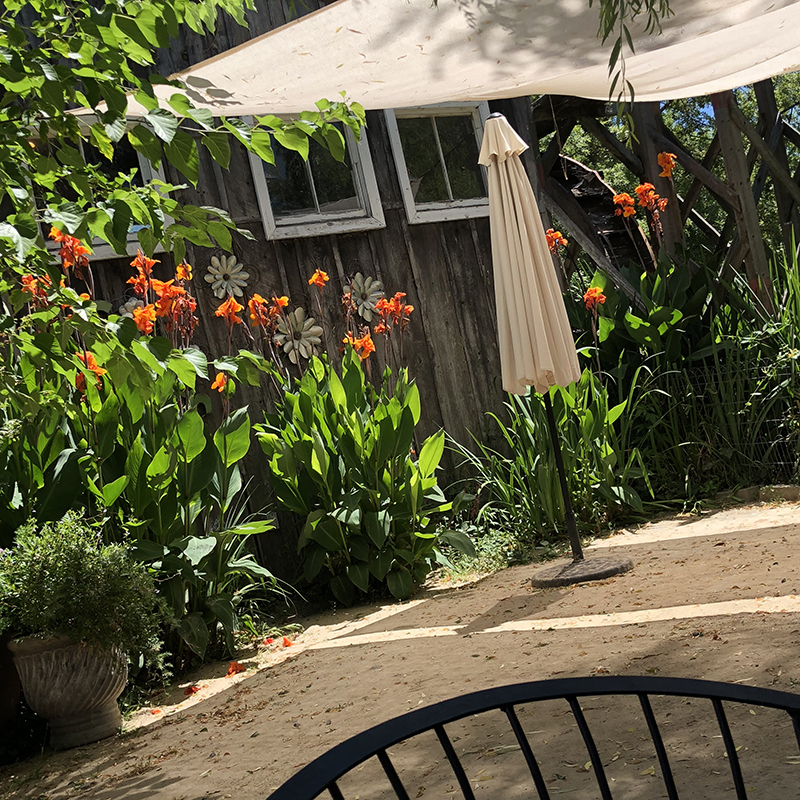 The Flower Farm Café outdoor seating had shaded areas under willow trees, umbrellas, shade sails and arbors with great views of the pond and garden areas. We chatted about it being a nice place for a bridal shower or birthday celebration. It was the perfect start to our fun day. 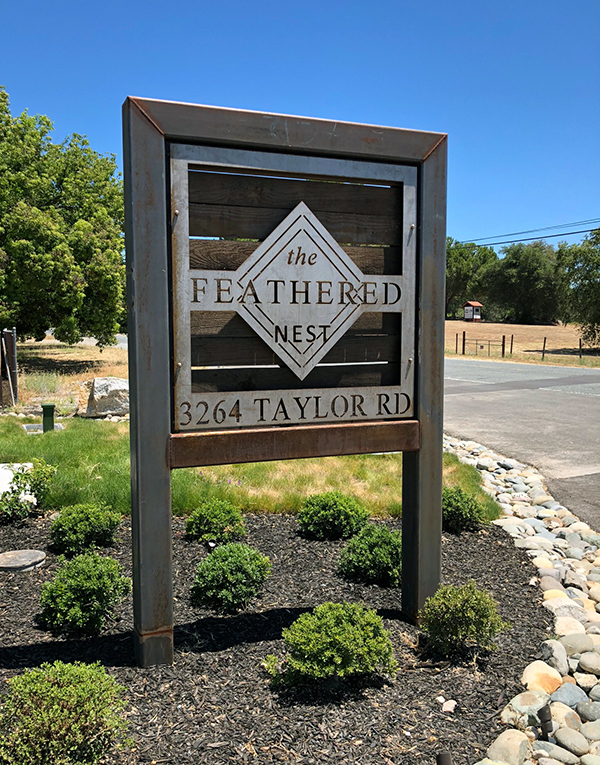 We left plenty of time to drive the less than 10 minutes to The Feathered Nest for our class. We pulled up and immediately wanted to move in. Ha-ha! The building was incredible. 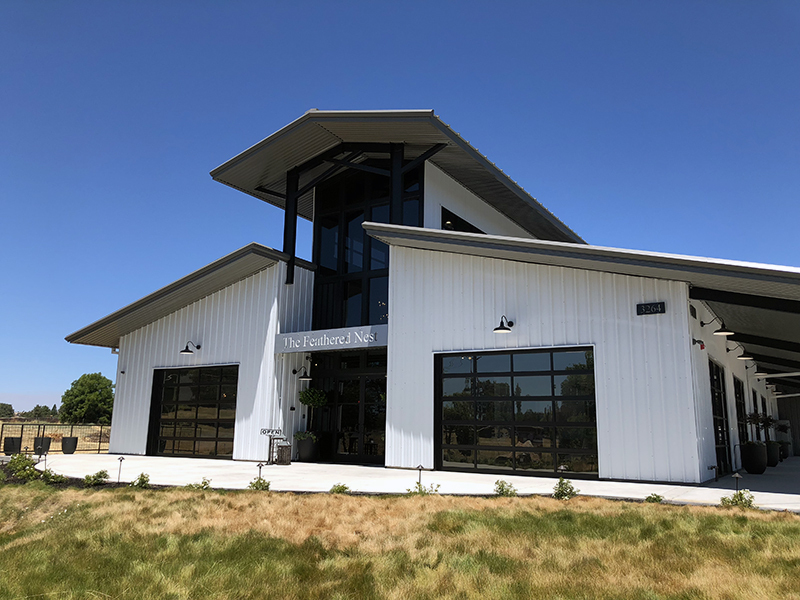 I went into full-on blogger mode and walked through the parking lot getting different angles of the building. I half expected to see Joanna and Chip Gaines because of the style. As soon as we walked through the front doors, I new I was in trouble. I wanted to purchase everything in the store – from a new dining room table (metal and wood inlay) to gorgeous lamps and a replacement couch for our great room. Since robbing a bank or winning the lottery isn’t in my near future (that I know of) – I had to stick to drooling and snapping inspiration photos. I did find a rug and a really cool throw pillow, but I’m trying to curb my obsession with pillows and switching them out with every trip to HomeGoods or Crate and Barrel. My guest bed has seven pillows, it’s a decorator’s sickness and one I’m having a hard time finding the cure for. 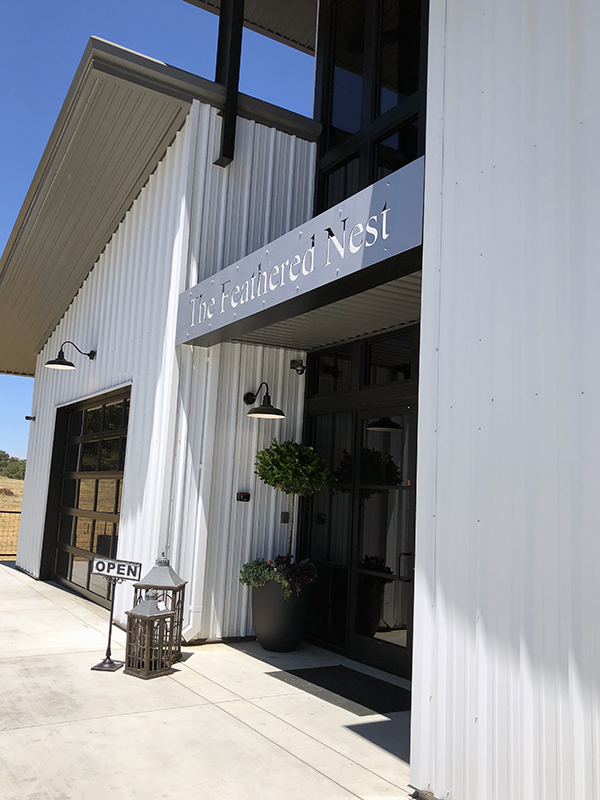 You can visit The Feathered Nest’s website to learn more about the beautiful store and how three girlfriends decided on making their vision into a reality. Carolyn and I gave ourselves a sneak peak into the room our class would take place in – and WOW, the light from the huge windows was perfect. We were surrounded by vibrant colors from all of the flowers and fabric samples – man I would love a room like that in my future farm house. One can dream! The flowers were simply amazing and we were excited to get started. Once all twelve attendees arrived, Lisa from Happy Road Farm got started. She talked about how she left her corporate job as a writer – searching to find something that fit better with her family, her passion, and her need for a more flexible schedule. Her house is on an acre and she always felt at peace spending hours in her garden, her happy place. She decided, why not? 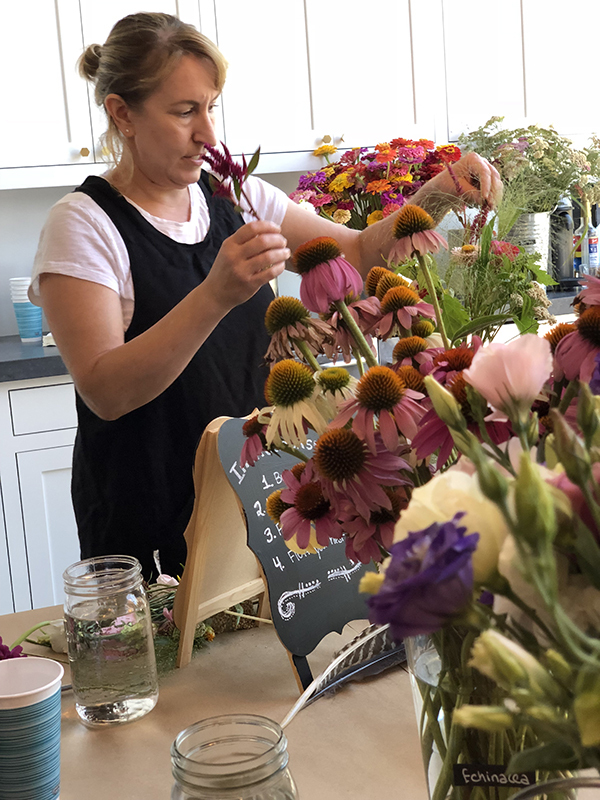 She started growing more of the flowers she loved and over a year ago – Happy Road Farm was born. (Sounds easy, right? Ha-ha. 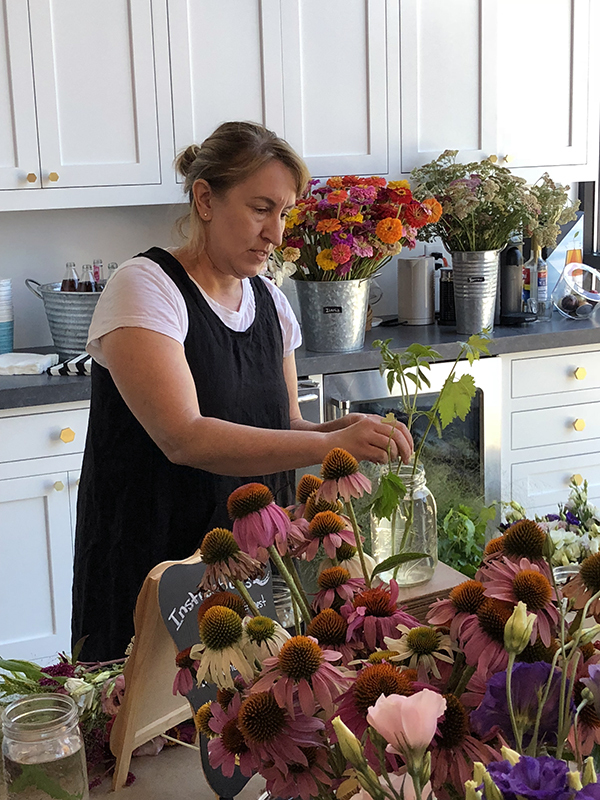 You can tell it’s a labor of love and growing in a sustainable way, not using pesticides, etc., has been a huge learning process for Lisa and her family as she doesn’t have a farming background.) 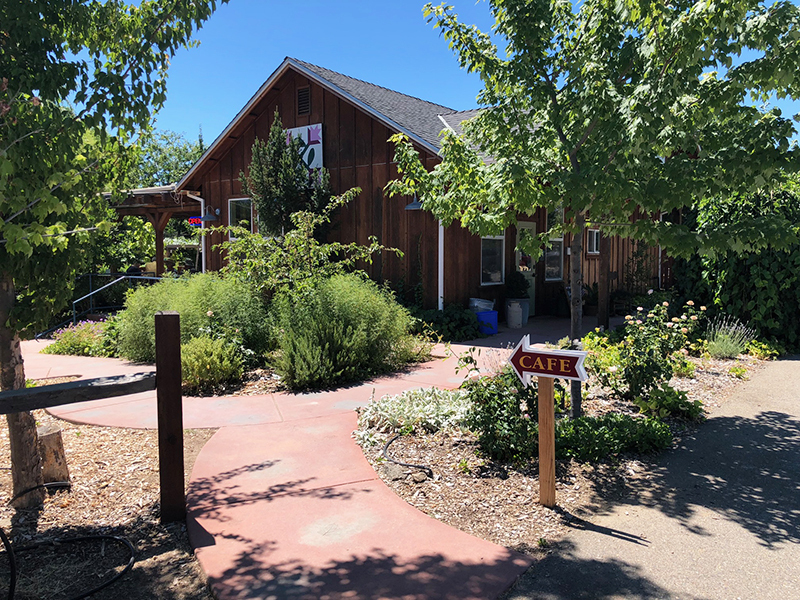 The farm is not open to the public, as it’s basically her backyard – but they do sell at the Placer Grown Loomis Farmers’ Market, which opens for the season this Thursday, July 12th, from 8am to noon in the Taylor’s Burger & Shake Shop parking lot at 3636 Taylor Road. 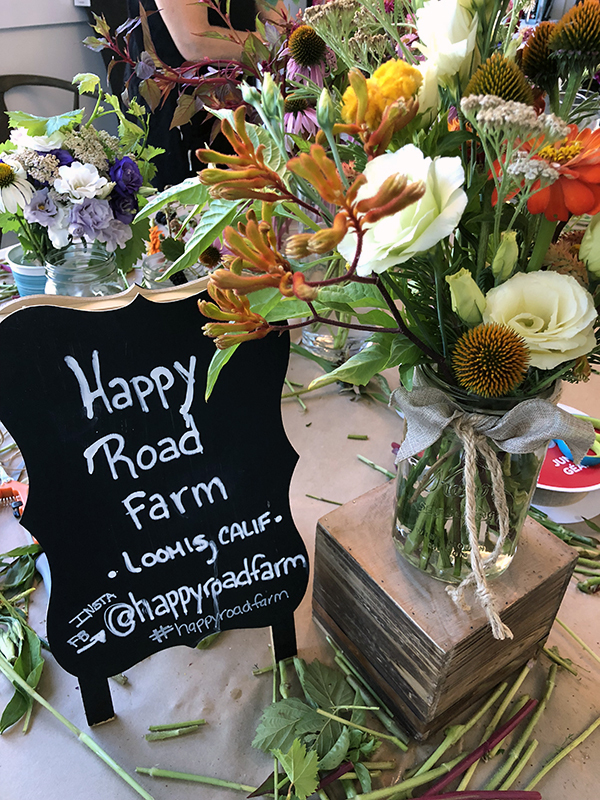 VillaSmith, High Hand and Newcastle Produce also have Happy Road Farm flowers on occasion – be sure to check out Happy Road Farm’s Facebook page or Instagram for updates and locations. It was time to get started. Lisa explained the process using a bird metaphor… perfect for “The Feathered Nest”. 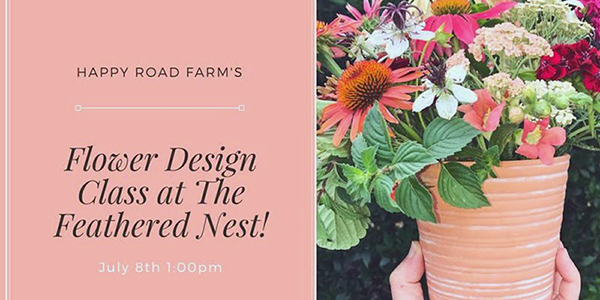 Build your nest: Create the base for your flower vessel. We used mason jars she picked up thrifting. She talked about using greenery – zucchini leaves, grape leaves, frosted explosion, and different herbs for her nest. Let the bird fly: There are no rules. Pick a color scheme and start selecting flowers that speak to you and your personal vision. Feather in cap: Choose a few show stoppers and carry out the color scheme in little places throughout. Name that flower – paging Carolyn to the white courtesy phone! Does anyone know what the above flower is? 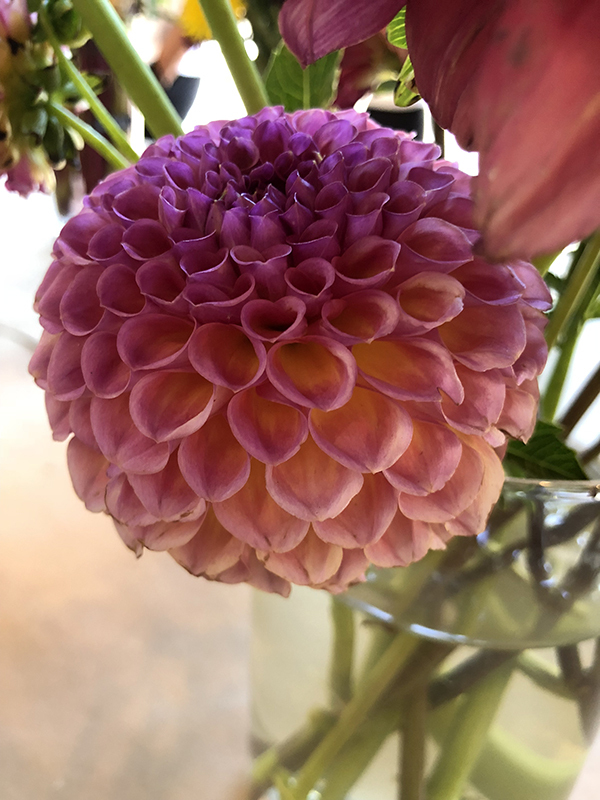 Is it an Ombre Ball Dahlia? I missed jotting down the name. 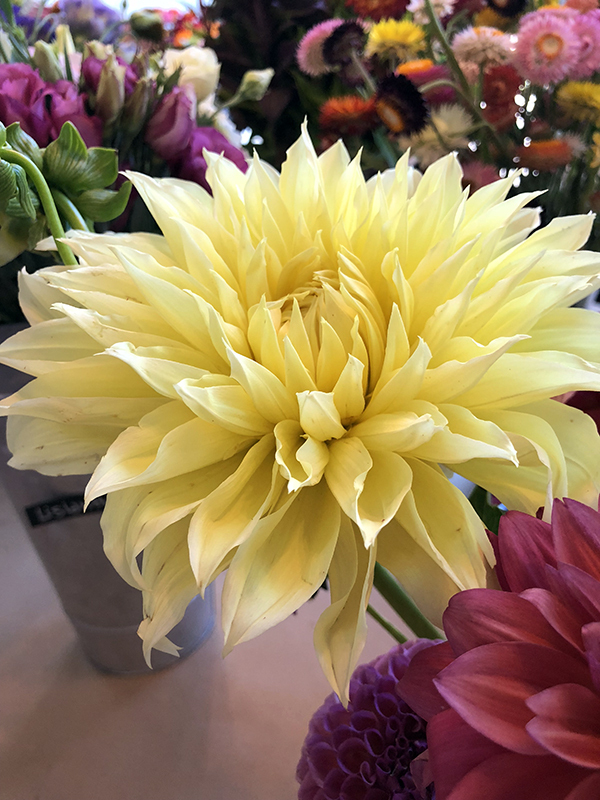 The Floodlight Dahlia was beautiful – definitely a “feather in cap” type flower. 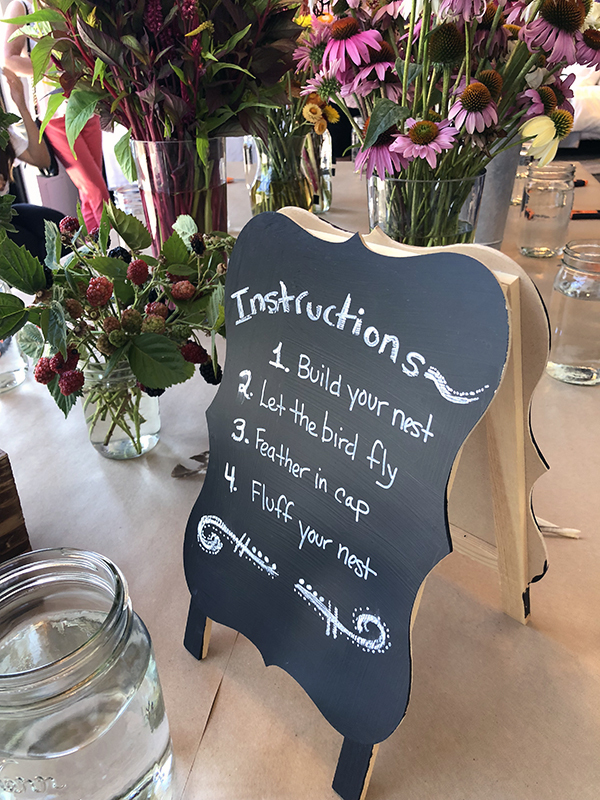 Fluff your nest: Once you think you are done, grab a hold of your flowers and fluff them – creating more space in between the stems. Figuring out when you are done is the real challenge. With so many beautiful flowers in front of you, it’s hard to not keep fussing with the arrangement. “Do you think it still needs a little something, something?” was the theme at the table. I apparently think it’s fall with my color scheme, LOL. What can I say? My house is beige, cream, and other neutrals with plants and artwork adding pops of color. I can’t even say my pillow obsession has helped with pops of color as I’m drawn to neutrals and textures when it comes to those. 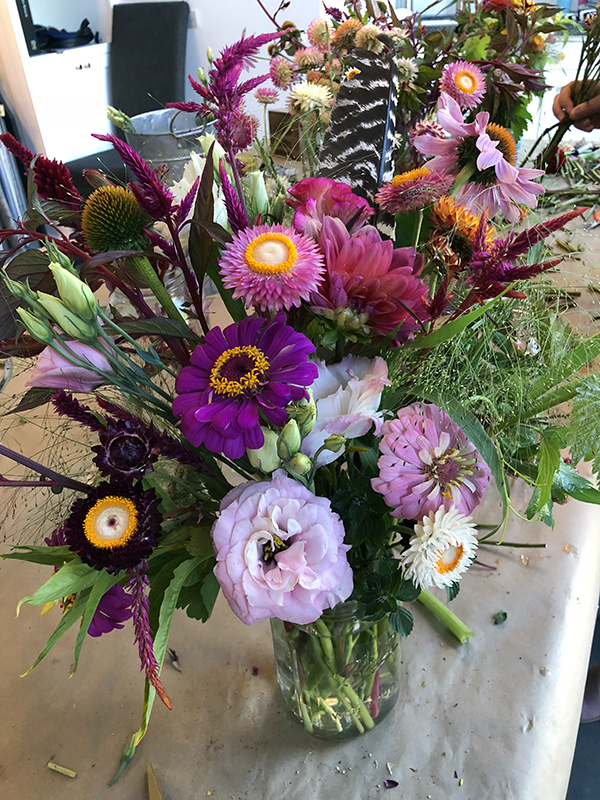 I used Kangaroo Paw, Rosemary, Echinacea (with the petals removed – a fun tip from Lisa that I hadn’t thought of), Lisianthus, Strawflower, Zinnia, Celosia and Yarrow in my arrangement and I’m sure I missed a few others. I was trying to be in the moment and some of the names escaped me. I also thought to myself – oh, I’m sure Carolyn will know them all because she’s a big flower nerd. Yep, pretty much the truth. We had spools of ribbon and jute to choose from for our finishing touches. I ended up braiding my jute and I liked the way it turned out. 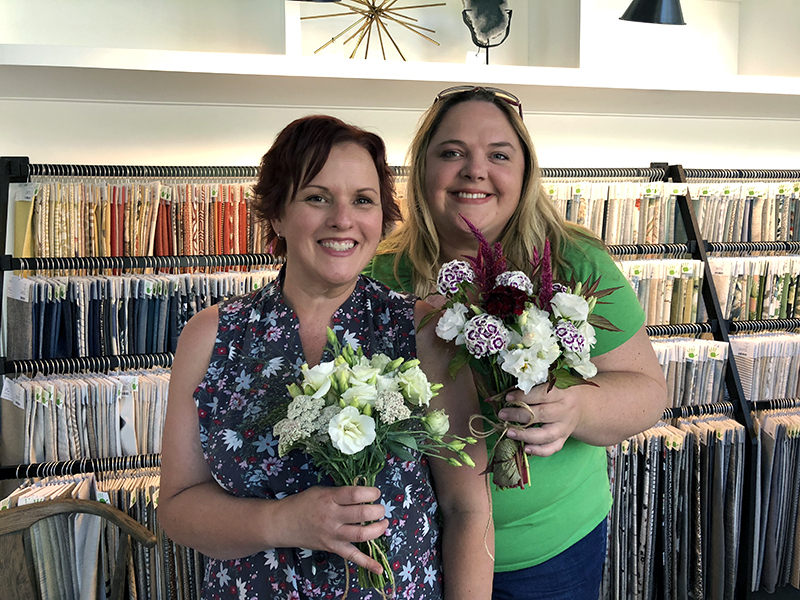 We enjoyed some beverages and chatted with other attendees as we continued selecting flowers. 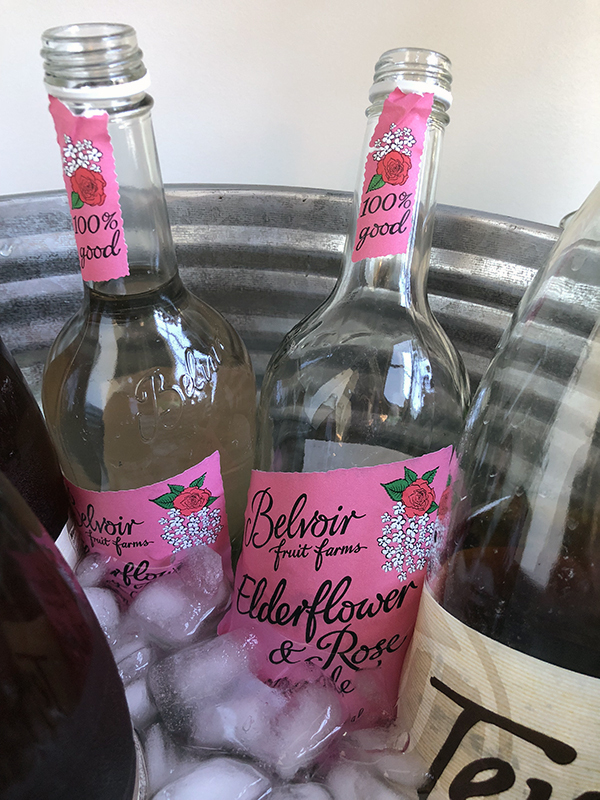 The Belvoir Fruit Farms Elderflower & Rose Lemonade hit the spot. One of the girls said you can get it at World Market or Whole Foods. I did a little research and Walmart apparently has it too. I’ll for sure be on the lookout. 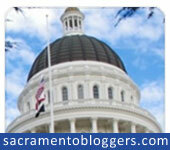 See, see… I mentioned something else foodie in this post. It’s not all flowers. 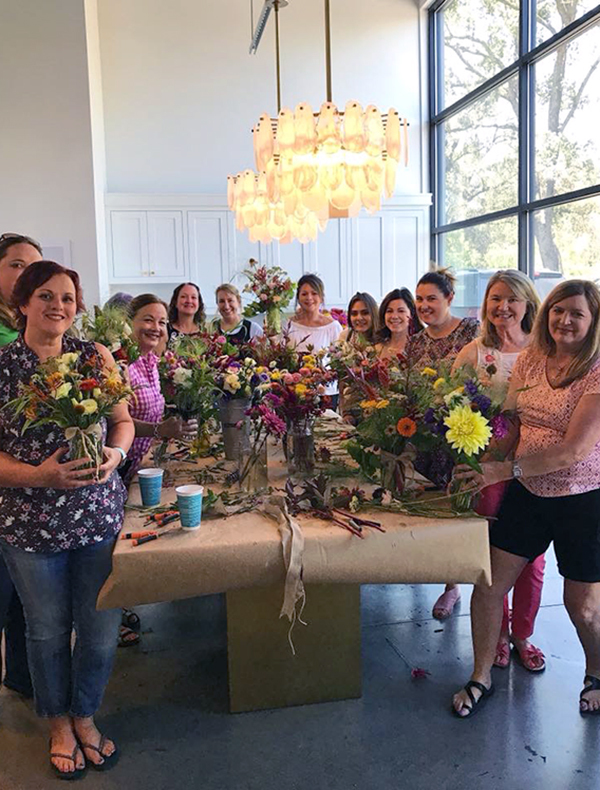 After we finished our masterpieces, Lisa invited us to take some extra flowers home for a second vase and we had fun picking those out too. 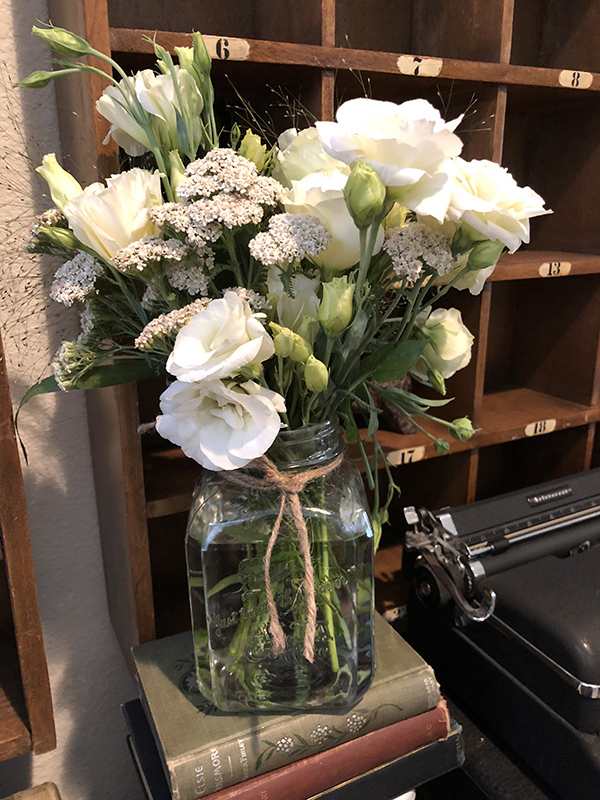 I mostly grabbed more white Lisianthus, Yarrow and Frosted Explosion for my second arrangement. Look at us all cute and bridesmaidy-ish. 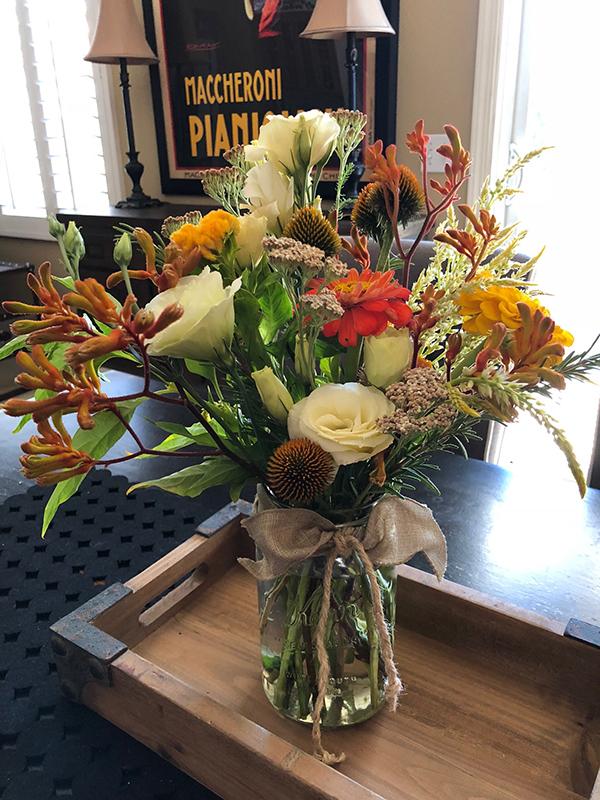 Lisa made an arrangement for The Feathered Nest staff to enjoy. She whipped that up in about 5 minutes. Such a fun group of ladies. 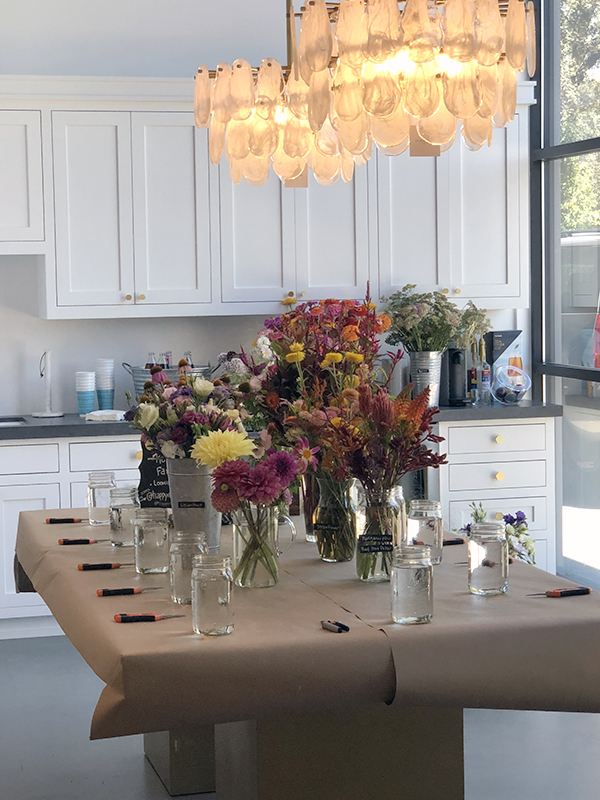 We really enjoyed the class and are already looking forward to the Happy Road Farm Crown Making Class in the fall. Not sure on location for that – this was Lisa’s first class at The Feathered Nest. Also, I’m so sorry for blocking 3/4 of your face Carolyn… my bad. I am happy to report that my arrangements made it home safely thanks to Carolyn’s quick thinking and a handy granola bar box. Fresh flowers make me smile. 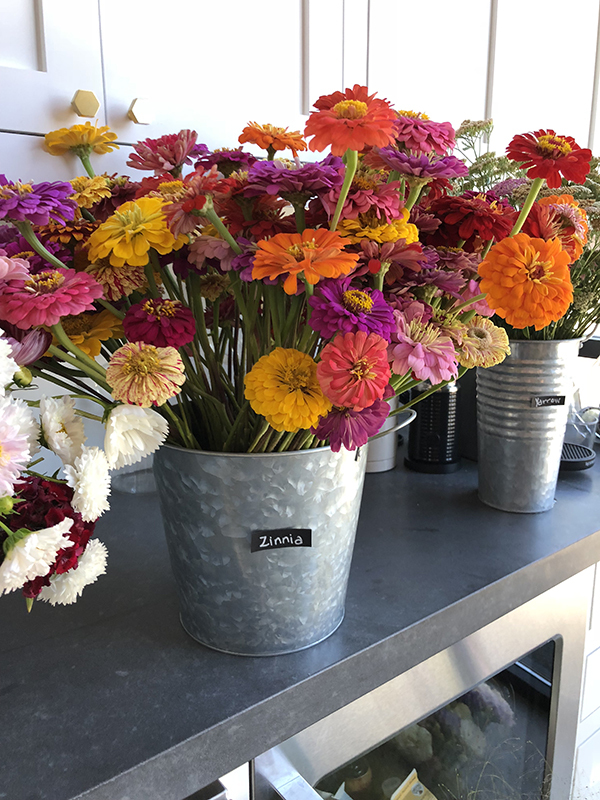 Fresh “farm grown with love” flowers brighten my world. 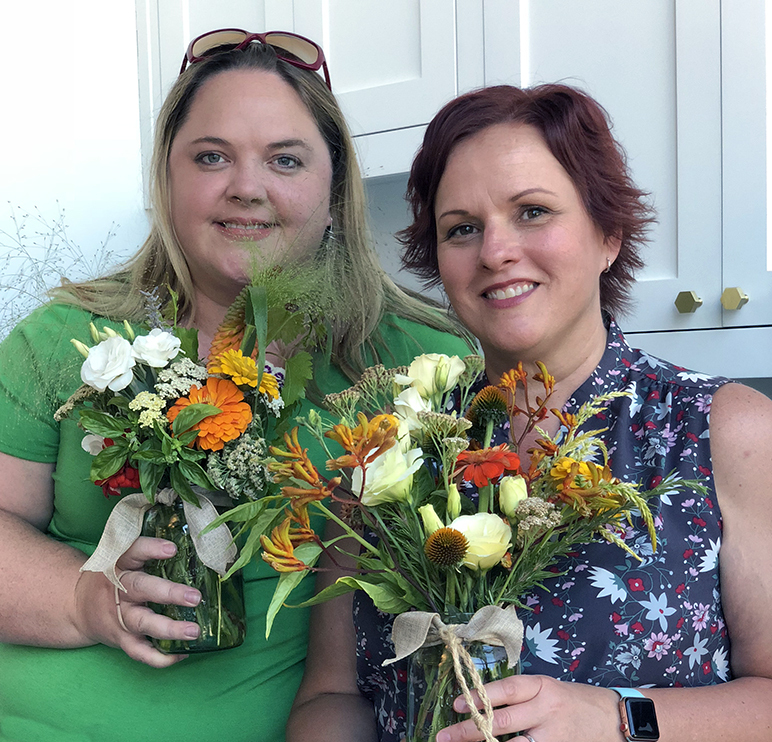 Thanks to The Feathered Nest for hosting the class and to Lisa at Happy Road Farm for teaching us things and supplying all of the beautiful flowers and to Carolyn for letting me know that I needed this in my life. Another adventure for the books/blog. 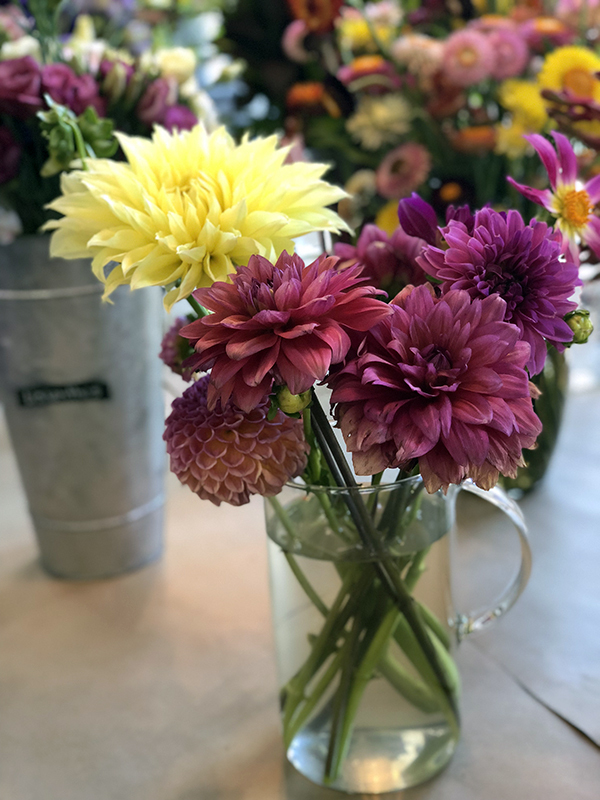 Do you buy flowers for yourself and your home on the regular? 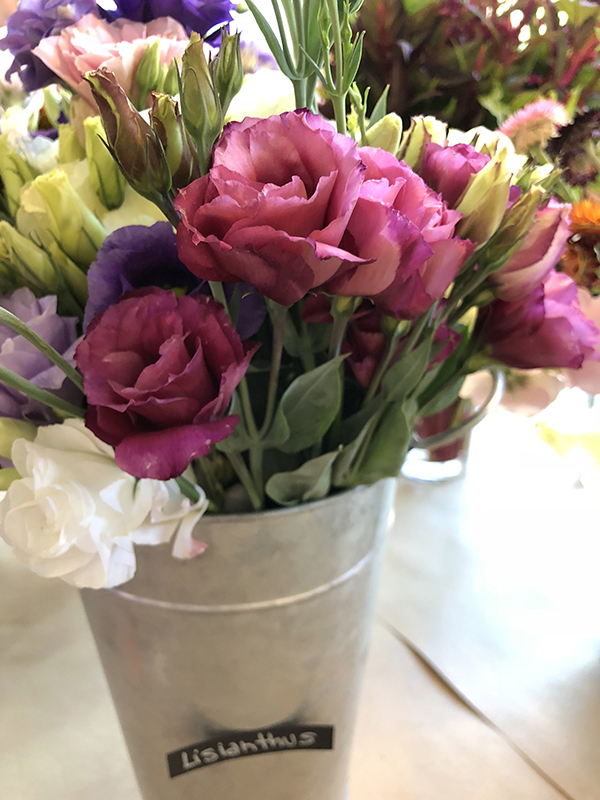 What’s your favorite flower? Very Impressive! This is very much down your alley and I’m happy that you have such a great friend. You and Carolyn manage to have the most interesting adventures. This one Barb and I would have enjoyed too.